Norwegian black metal masters 1349 have released a new single, titled “Dødskamp”. The song has been commissioned by Innovation Norway, Visit Norway and the Munch Museum, who asked four Norwegian artists within four different genres of music to interpret their angle on a freely selected work by the famous painter Edvard Munch. Naturally, 1349 approached the art of Munch from their black metal perspective. The new single can be found on all digital platforms and streamed via the official Season Of Mist YouTube channel below. The song is available on vinyl, together with the bonus track “Atomic Chapel” and can be pre-ordered the Season Of Mist shop. 1349 will return with a full-length release later this year. DEMONAZ Speaks about Upcoming New Album and Arm Injury! 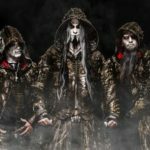 IMMORTAL Announce “Northern Chaos Gods” Album Details, Cover Revealed!